I stumbled on a welcoming Mail fix this morning which restores Leopard's (Mac OS 10.5) «Copy Address» behaviour. In Snow Leopard (Mac OS 10.6), Mail's «Copy Address» contextual menu command copies the name and enclosed the address in angle brackets. As in «John Doe <[email protected]>», which turns out to be annoying as most of the time I have to edit the pasted text in order to remove the brakets and/or name. 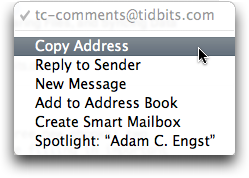 and next time you use the «Copy Address» contextual menu command, it will only place the e-mail address on your clipboard. Bliss. Thanks Ken, this fix is most welcome. When I do this I get a message that says "command not found". Suggestions? @Alexander MacDougall: did you copy the whole command?